By CBS News producer Phil Hirschkorn. A federal government official is now under scrutiny in a widening probe into the $85 billion-a-year college student loan industry. Three major universities have suspended top financial aid officials in the wake of the investigation by the office of New York State Attorney General Andrew Cuomo. The investigation now extends to a current Education Department official with former stock holdings in a leading student loan company, Matteo Fontana, the general manager of the National Student Loan Data System, a central database for student aid, including the federal direct loan program and Pell Grants, CBS News has learned. Fontana and the universities are being scrutinized for their ties to Student Loan Xpress Inc., one of the fastest-growing student loan companies since its launch in late 2001, and its current parent company, CIT Group Inc., a Fortune 500 company traded on the New York Stock Exchange. Cuomo is investigating what he calls "potentially improper stock grants," including one stock sale that Cuomo alleges netted an Ivy League official a six-figure profit. Cuomo's office says it has issued subpoenas for documents and testimony to Student Loan Xpress and CIT, as well as a subpoena to Columbia University and document retention letters to the University of Texas-Austin and University of Southern California. According to financial documents and the New York attorney general, the officials in question were once stockholders in Education Lending Group, Inc. (EDLG), which until 2005 was the parent company of Student Loan Xpress. All three schools currently list EDLG as a "preferred" lender for students needing financial aid. About 90 percent of college students who currently borrow money for college turn to lenders designated by their schools as preferred, Cuomo says. Based in San Diego, Student Loan Xpress says it is now the eighth largest student loan provider in the country, according to Student MarketMeasure, Inc.
Fontana once owned 10,500 shares of EDLG stock, according to a prospectus filed by EDLG with the Securities and Exchange Commission in September 2003. At the time, the company was offering more than 8 million shares of its common stock then trading on NASDAQ for $9.54 a share. CIT completed the buyout of EDLG for $19.05 a share in Feb. 2005. "The department takes this matter very seriously, and our office of the general counsel is actively reviewing it," said Education Department spokeswoman Samara Yudof. "We are providing the department's Inspector General all relevant documents." She added that Education Secretary Margaret Spellings has been briefed by staff. Fontana did not immediately reply to a request for comment. "We need to ensure that those charged with administering federal student loan programs put the interests of students first," said Edward Kennedy, who chairs the Senate Committee on Health, Education, Labor, and Pensions, and is also probing the student loan industry. "It is inexcusable for students to be paying the price for backroom deals in the student loan industry." On Thursday, USC and UT-Austin joined Columbia in placing financials aid administrators on paid leave pending the outcome of the probe. The attorney general's letters to the school presidents ask them to determine whether their financial aid officers "received any payments, stock, or other benefits" from any lenders and to divulge how the schools choose their preferred lenders during the past six years. 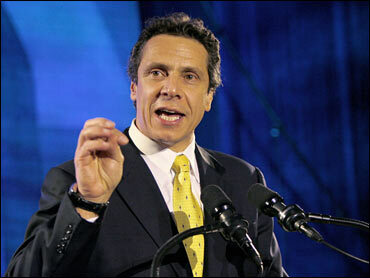 Cuomo's office singled out the financial aid directors at UT-Austin, Larry Burt, and at USC, Catherine Thomas. "We have reason to believe," the letters said, that the officials may have received shares or stock options "directly from the company … in exchange for placing Student Loan Xpress" on its preferred lender list. Burt denied the charge. Thomas was not available to comment. UT-Austin President William Powers suspended Burt on Thursday, telling the university community in a letter, "It is important that the university ensure the integrity of its financial aid program and maintain unimpeachable practices on behalf of students and their families." In addition to Fontana, the prospectus EDLG filed with the SEC in 2003 listed Burt and Thomas, and Columbia financial aid administrator David Charlow among its selling stockholders. According to the prospectus, Thomas and Burt each owned 1,500 shares of EDLG stock and 500 stock options, while Charlow owned 7,500 shares and 2,500 stock options. Charlow earned over $100,000 on the sale of his shares, according to the attorney general's office. Columbia placed Charlow on a paid leave of absence Tuesday, when the university found out from Cuomo's office that Charlow had owned EDLG stock until 2005. Charlow did not immediately return phone messages left at his home. "The case here appears to involve a single official who may have violated our policies, and we believe that this has had no adverse financial consequences for students and their families," two Columbia deans wrote Thursday in a letter to students. It was in 2005 that Columbia approved four preferred lenders, including Student Loan Xpress, that "provide an array of products that are beneficial to the college's diverse student population," spokesman Robert Hornsby said. But on Thursday, Columbia temporarily removed Student Loan Xpress from its list and persuaded the company to delete from its website Charlow's endorsement of its "very high standards for service." Burt told CBS News in 2001 he had paid $1 per share for his investment in Direct III Marketing, a student loan consolidation company that would change its name to EDLG in 2002. "I was told it was a risky venture," Burt said. He said he was advised of the investment opportunity by Fabrizio Balestri, who Burt said, used to work for American Express Student Loans, whose staff went on to form EDLG and Student Loan Xpress. Balestri is now president of Student Loan Xpress. Burt said he recalled selling his shares in 2003 for $9-to-$12 — about a $15,000 profit. "When I purchased those shares, they were not in the FFELP business," Burt said, referring to the federally-backed student loan program. He said that the company was at the time not dealing with current students but only loan consolidations for former students. Student Loan Xpress now does both. It is also one of UT-Austin's 20 preferred lenders, handling about 4%, or $10 million, of the school's annual loan volume. In California, USC placed Harris on paid leave Thursday. USC spokesman James Grant said the school "will now review the information in the letter and respond" to Cuomo's office. Student Loan Xpress is one of nearly 30 preferred lenders for USC students, Grant said. CIT, a New York City-based commercial and consumer financing company with $74 billion in managed assets, acquired EDLG two years ago. Student Loan Xpress is its only subsidiary in the student loan business, said CIT spokesman Curt Ritter. "The reported transactions in securities of that company occurred several years prior to CIT's acquisition of the company. We are currently seeking to determine the facts surrounding those transactions," Ritter said.